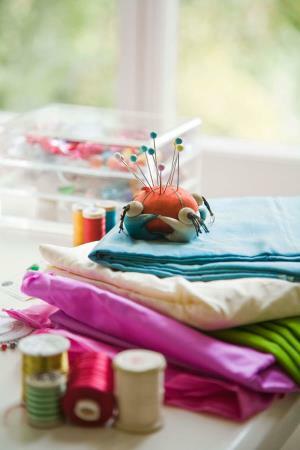 Even if you have a dedicated space for your hobbies and crafts it doesn’t take long before things start to spill out. It seems an obvious way to express creativity – but, before we know it, the garage workbench is looking like the local car boot sale and the dining room table is piled high with pieces of thread, papers and other hobby supplies. Clear plastic stackable containers with lids are a great option for confining similar craft supplies together. Choose containers appropriate in size to the craft and use plastic Ziploc type bags to keep like items separate within the container. Make sure you label the container. Store these containers on the floor, in the void section of your wardrobe (ie: under the hanging rail) or in a dedicated cupboard. If space is a problem and your hobby involves lots of little bits and bobs – visit www.pepperplum.co.za for a plastic over-the-door-style shoe bag. This is great for holding scissors, glues, beads, buttons, paint tubes, etc. Attach the lids of clear jars to the underside of a shelf in your hobby work area. Simply screw on/off the jar whenever you need to. This is a great method for storing small screws and hooks and paint touch-up samples. If your space is limited this system acts as a great space saver too. Printers’ trays in various sizes are fabulous for ensuring that your craft supplies are easy to reach. Because they remain visible they also tend to get used more often. Purchase some clear glass jars and fill them with paint, glitter and glue and display them on the tray. Decorative jars and open containers on a desktop are super for holding feathers and brushes or use plastic, wooden or steel cutlery trays in drawers to keep these items visible and usable. Convert your bookshelf into a hobby shelf by sliding clear containers (no lid necessary), wicker baskets or any other labelled containers onto the shelves. This is easy for taking out and putting away. If you are concerned with how it all looks, make sure that you choose containers that you actually like and that blend with your decor. Remember that hobbies take up a lot of your time. Be realistic with what you choose to practice as a craft/hobby – there is no point in saving every spare piece of serviette, silver foil, button, bead or nail if there is not enough time for you to make use of it. Set limits in place and know that once the jar, container or box is full; you have enough of what you need. If you still want to add another piece of ribbon practice the one-in-one-out principal where you remove one item for every new item you add.